When we took these pictures a month and a half ago, I had every intention of posting them within a few days...but somehow never got around to it!? Oh well, life happens and as I always say, better late than never! My version of winter layering may look a bit different than yours, depending on where you live. Layering in Arizona doesn't require a puffer jacket or boots, an open toe sandal will suit you just fine! There are days when I wish we had a legitimate winter, with snow falling and temperatures so cold you can see your breath. But I honestly don't mind these warm months, because they make me that much more excited for Spring! I'm really looking forward to wearing some brighter colors this spring and experimenting with new ones I haven't dabbled in, but if you know me then you know I love neutrals! Something about them just draws me in, whether it's a creamy off-white hue or a rich camel tone. A neutral color palette just speaks to me in ways I can't explain, and when I look in my closet I sometimes feel guilty for having a lack of color, so it's something I'm going to try and change this season. However, I will say when I do wear neutrals I love mixing different shades/hues together. 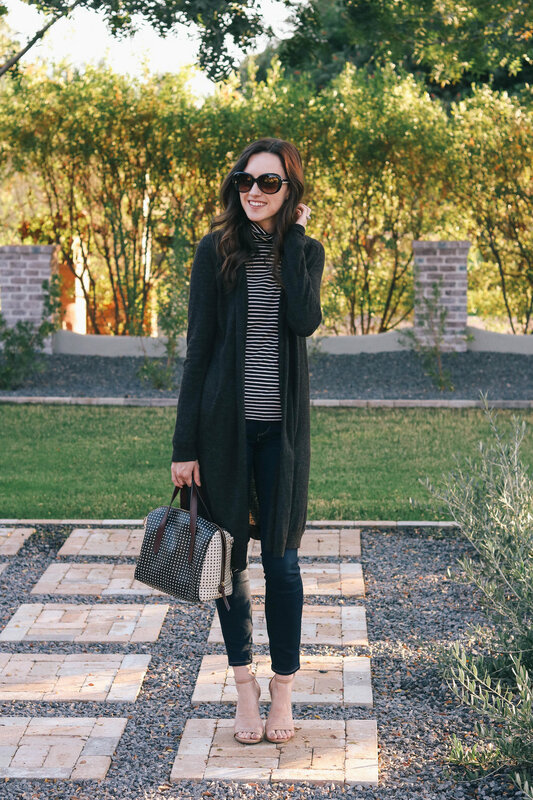 Like in this outfit, I paired a black and white striped turtleneck with a heather brown duster.